From left, club members Linda Shoemaker, Sima Jafarina and Barbara Crane with Chief Laura Farinella, second from right. Ranger, the Laguna Beach police dog purchased with funds raised by the Woman’s Club, waited patiently in a van as his handlers prepared to demonstrate the dog’s abilities for his patrons on Thursday, April 28. Unfortunately, the featured performer that members and guests lined up to see was called for duty at a rally in Costa Mesa where activists protested the appearance of presidential candidate Donald Trump. 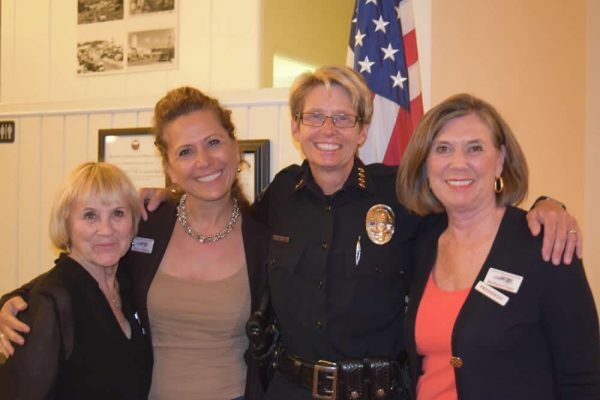 Club President Barbara Crane stepped up to introduce Laguna Beach Police Chief Laura Farinella, who instead described the department and studies she has initiated. Using video charts, Farinella detailed her various concerns, including coping with the town’s visitors, and how she is dealing with them.